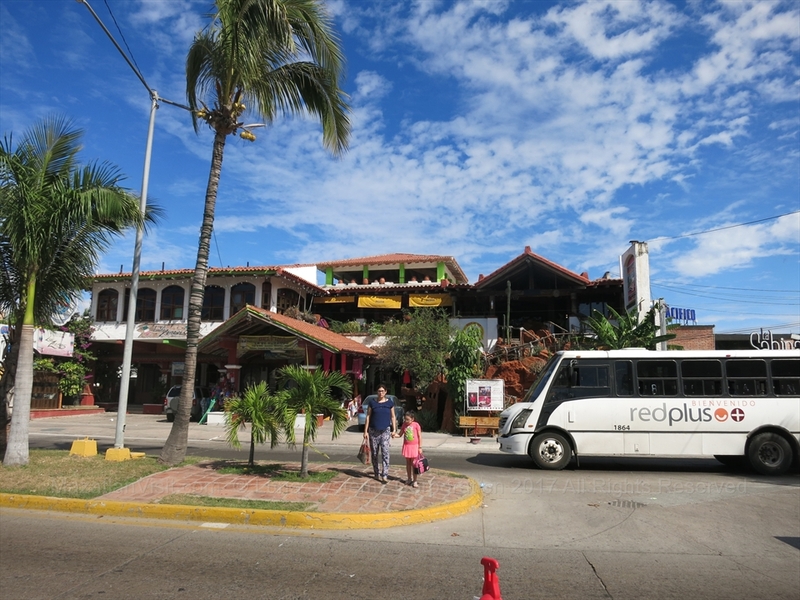 There are thousands of restaurants in Mazatlán. 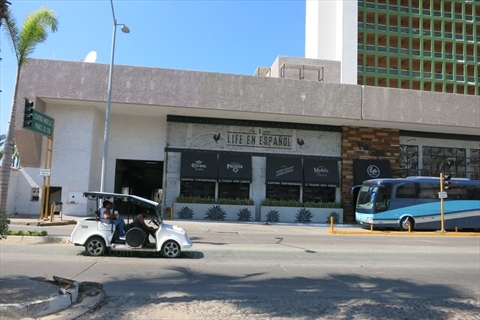 We will discuss a large selection of the best restaurants for visitors and residents of Mazatlán based on our many years of eating out in Mazatlán. We will give you a mix of different types of restaurants (e.g. 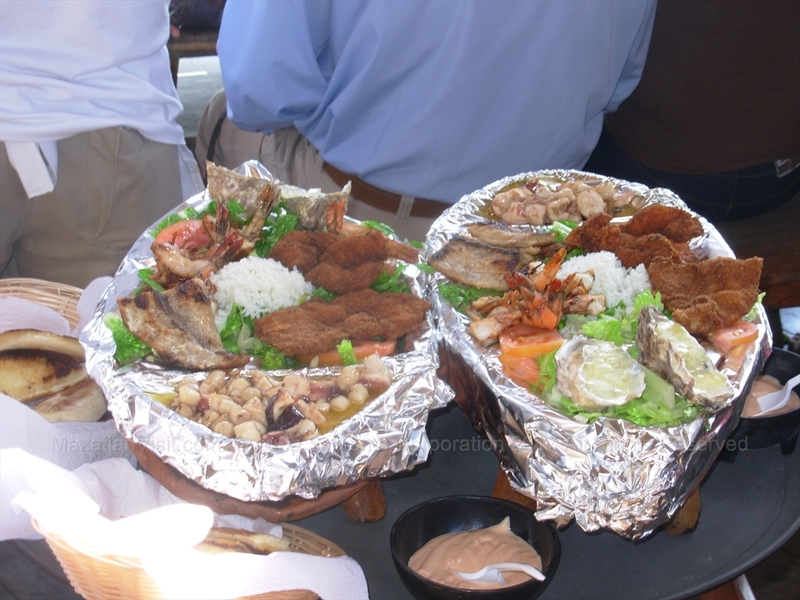 street food, regular restaurants, restaurant/bars, sports bars, outdoor restaurants, etc.) serving different types of food (e.g. 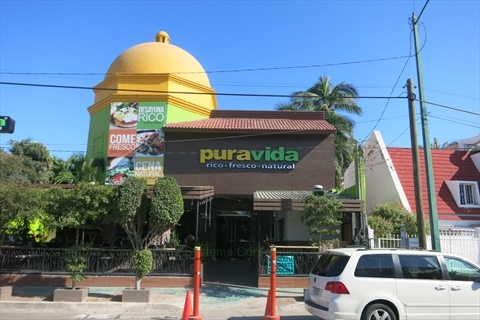 mexican food, seafood, healthy food), in different locations in Mazatlán (e.g. Golden Zone, Cerritos, Olas Altas, Plaza Machado) at various price points (e.g. cheap, reasonable, expensive) and provide information for you to contact them to make reservations and give you our opinion on why you should go to these restaurants. Most of the big hotels also have fabulous restaurants. We especially love the weekend buffet at the Hotel Playa Mazatlán and the eggs benedict at The Inn at Mazatlán! Mazatlán also has many street vendors selling hot dog and tacos. Most of the hot dog vendors are located in the Golden Zone near the Nightclubs to feed all the hungry people coming out of the nightclubs late at night! 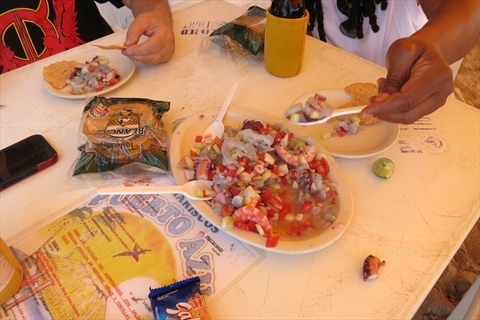 In other parts of Mazatlán, there are street vendors that serve taco and seafood on the street! 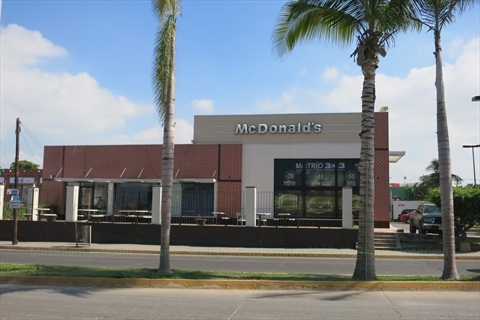 There are also fast food and chain restaurants throughout Mazatlán. If you have any restaurants that you recommend, please contact us and we will add it! 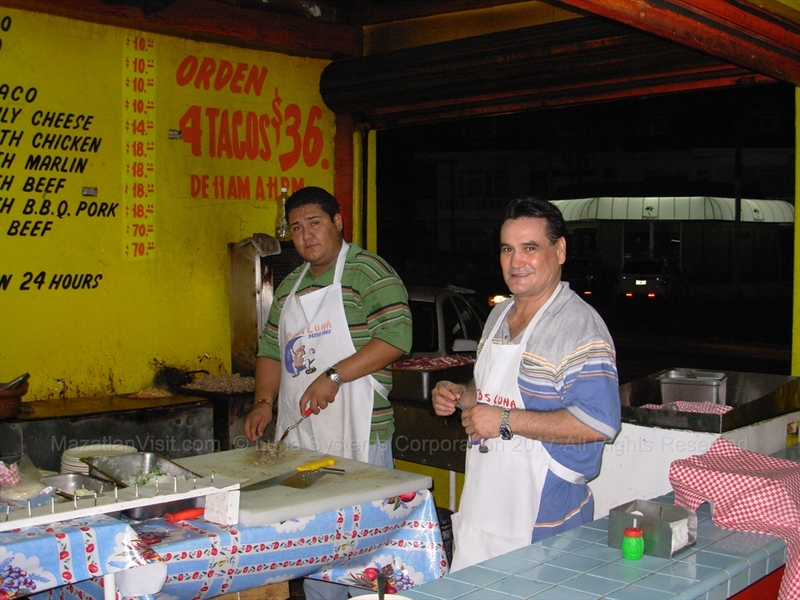 best hot dogs: Leos-street vendor across from Burger King on corner of Avenida Camaron Sabalo and Bugambilia! reader's choice: email us the name of your favorite restaurant! TIP: To avoid getting sick...only eat in restaurants or from street vendors that do high volume! Agatha is a new (2017) fancy restaurant in the Golden Zone. 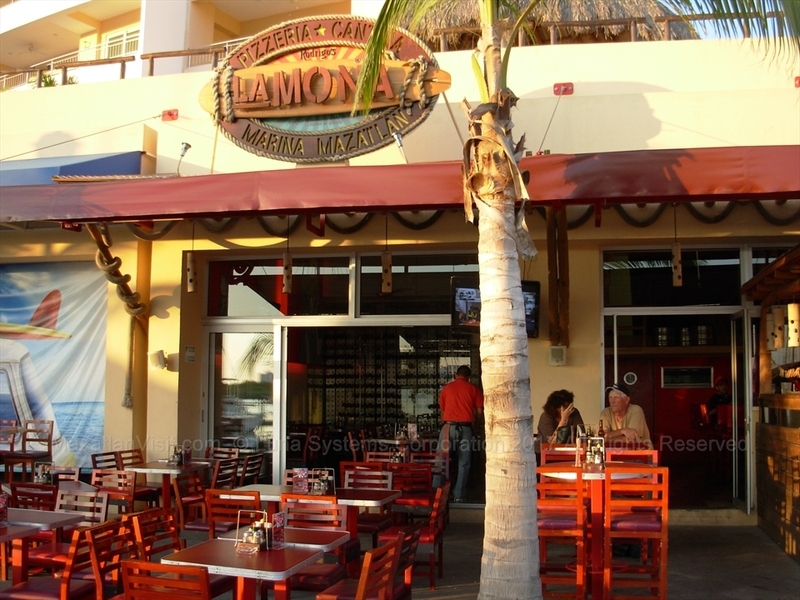 It is located almost across the street from the Ramada Resort Mazatlán. It is an upscale restaurant. There are both indoor and outdoor sections. 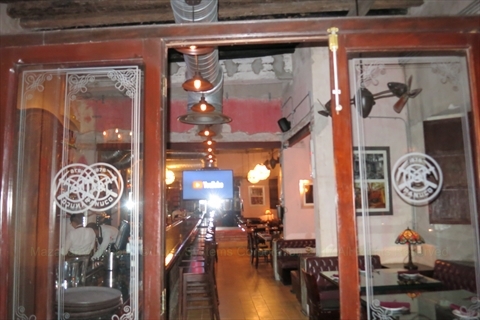 The decor is very modern with a fabulous long bar and lit inner courtyard. They have a full menu including salads, soups, sushi, seafood, beef, pork, and deserts. We have eaten here and the food is excellent! Allegro Caffe is a cafe that serves food. They have 2 locations: Golden Zone and Historic Old Town. They serve all the specialty coffees that you would expect and food We haven't eaten there, but our friends have and they all rave about the great breakfasts. 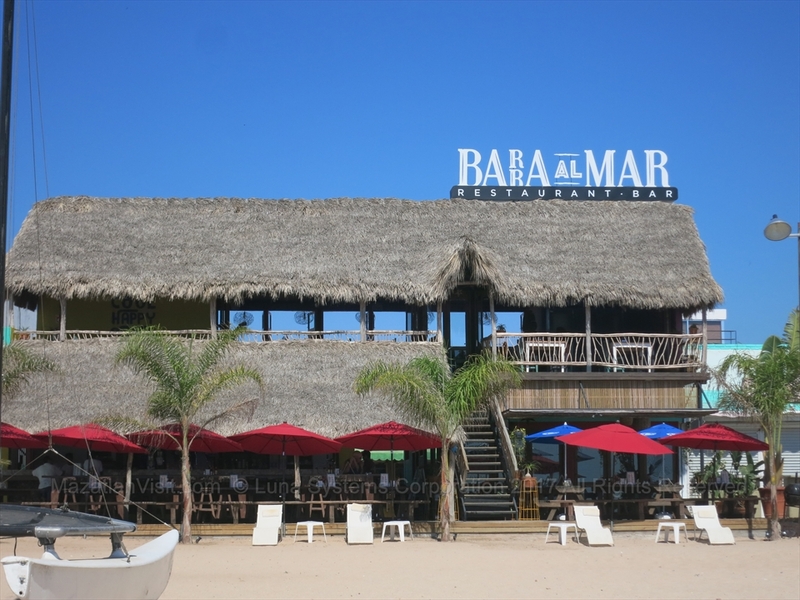 Barra Al Mar (BAM) is a new (2016) restaurant and bar located on the beach in the Golden Zone. It has a palapa (grass) roof and has outdoor and undercover seating. We have eaten here and the food is good. This restaurant is a little hard to find. You need to walk up the alley between the big Senor Frogs store and the Golden Star restaurant to get to it. 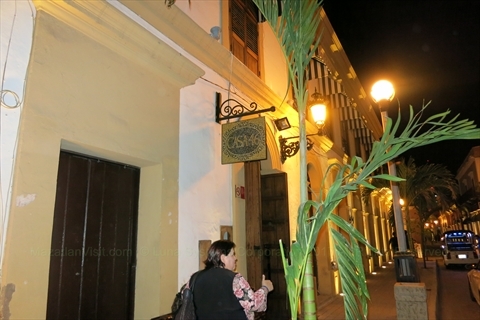 Casa 46 is a new fancy restaurant located in the Plaza Machado in the old town of Mazatlán. It is located on the 2nd floor of the plaza on the corner, with it's entrance on the side street. They have both an indoor and outdoor section. The outdoor section looks out over the plaza. We have not eaten here yet, so we cannot comment about the food. Cheers Restobar is a bar with food in the Golden Zone. It has live music most nights and serves beers by the litre! It is frequented by a young, local crowd. 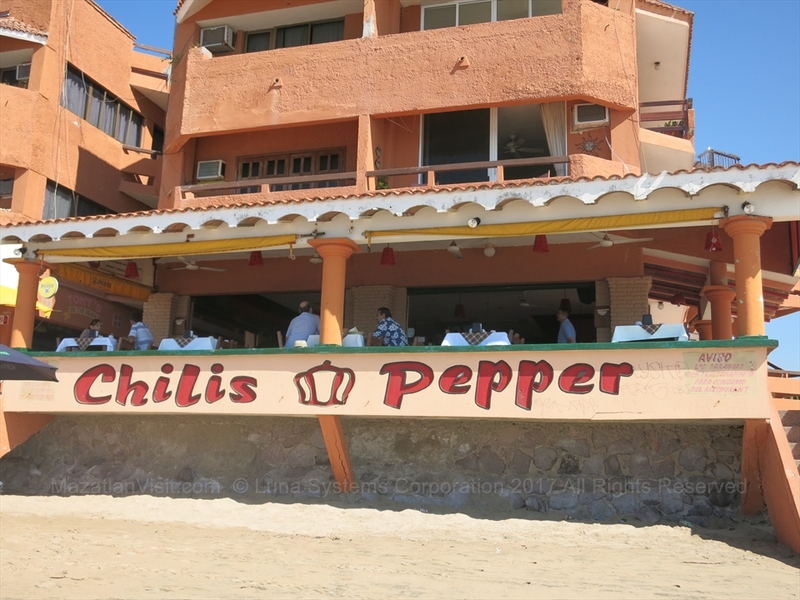 Chili's Pepper is a long-time beach-front restaurant in Mazatlán. We have not eaten here yet so we cannot comment on the food or service. Compania Minera de Panuco is the sister restaurant of the Presidio. It is a modern air-conditioned upscale restaurant. The cooks are the same as for the Presidio so the food is excellent, however, it is in a more modern setting than the Presidio. It has large TVs showing sports and a long bar which makes it a little less formal than the Presidio. We have eaten here a number of times and the food is excellent. We have generally eaten here rather than the Presidio when the outside temperature is too high! The shrimp tacos are one of our favorite dishes. 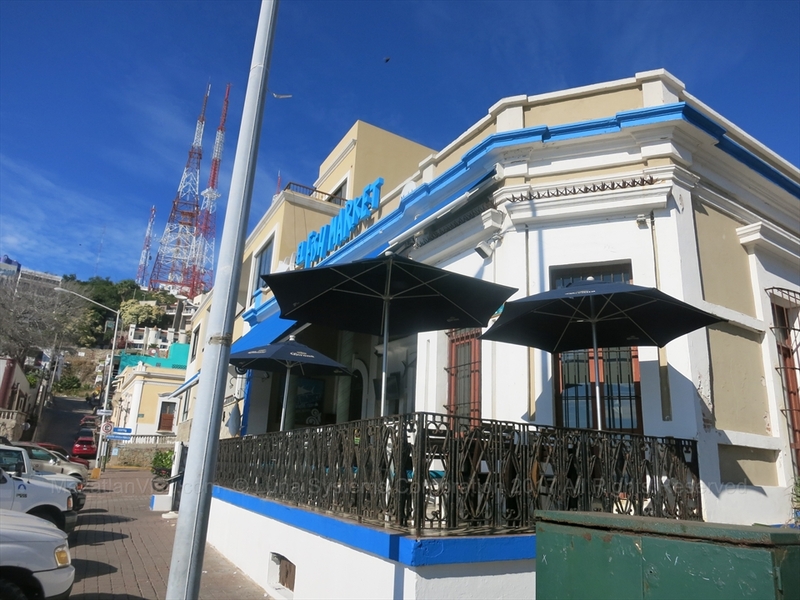 Copa De Leche was a restaurant in Olas Altas right on the main street. It was famous for having a 100+ year old boat as part of it's bar. 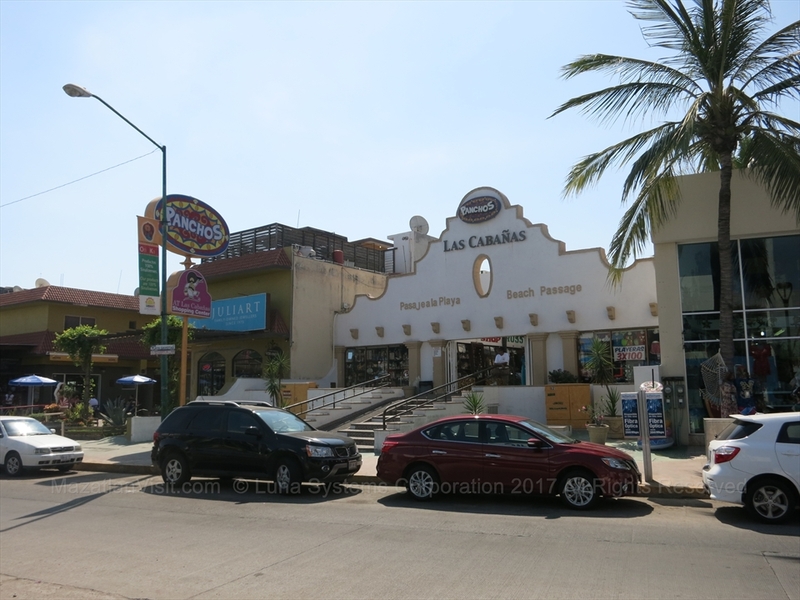 La Corriente is a restaurant and bar located right on the beach on the Malecon in Mazatlán. It is a great place to go for lunch or late afternoon to watch the sunset. They have some lounge chairs where you can sit which are very comfortable. 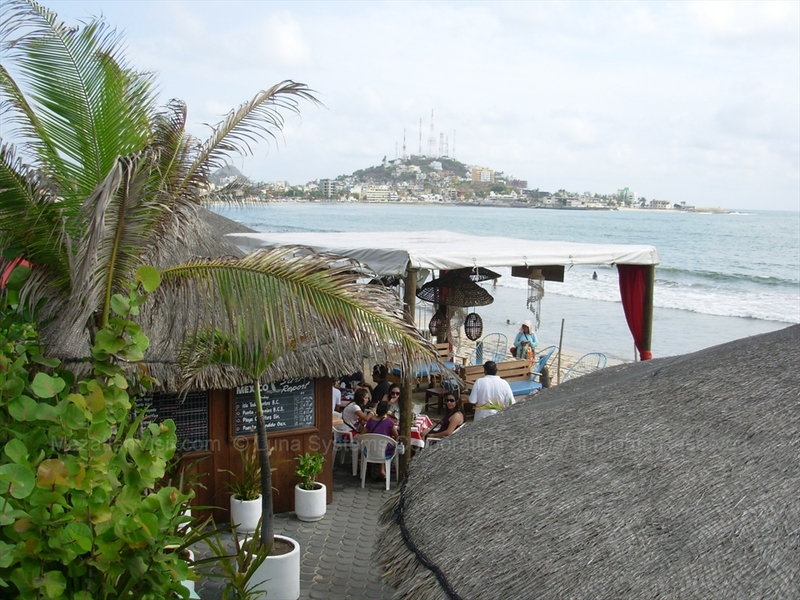 Diego's Beach House is a restaurant/bar located right on the beach north of the Golden Zone in Mazatlán. It is open air with parts that have a roof and parts that don't have a roof. So, you can sit in or out of the sun. They also have some tables right on the beach. 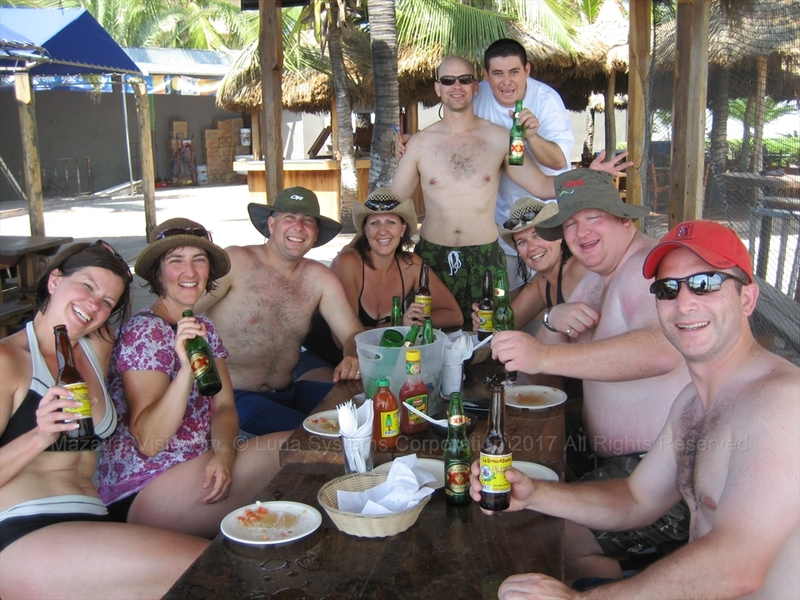 They host the all you can drink Brenster Beach Bash on Tuesday afternoons from mid-Oct to mid-Apr each year. They also have bands after the Brenster Beach Bash and on many other nights of the week. Originally, it was a BBQ restaurant, but the menu has expanded greatly to include fish, shrimp, wings, and salads also. We still recommend that you try the BBQ items! 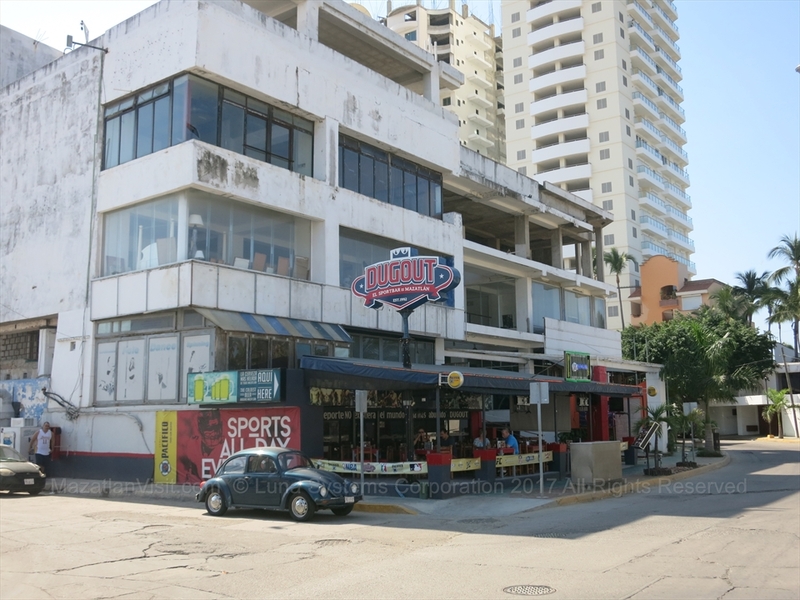 Dugout is a long-time sports bar and restaurant in Mazatlán. The staff is really friendly and will try to accomodate any sport or game that they can. Most of the servers speak english well. It is usually very busy during NFL and NHL games. They have a basic menu that is a little more on the deep-fried side. They also have a pool table. 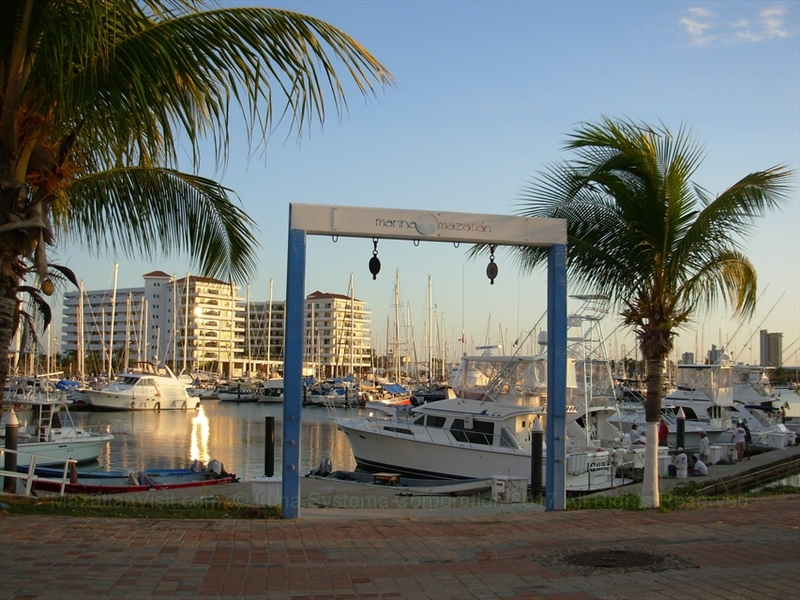 There are 3 El Fish Market restaurants in Mazatlán: Olas Altas, Sabalo Country, and Marina. It is a seafood restaurant. 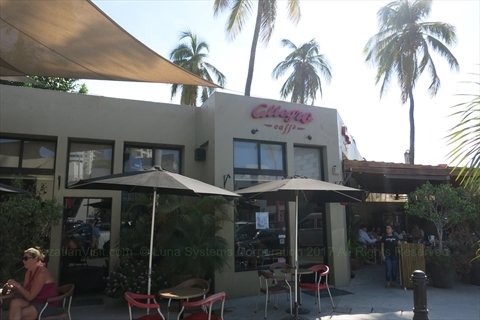 The Olas Altas location is located right on the main strip and has an indoor and outdoor section. 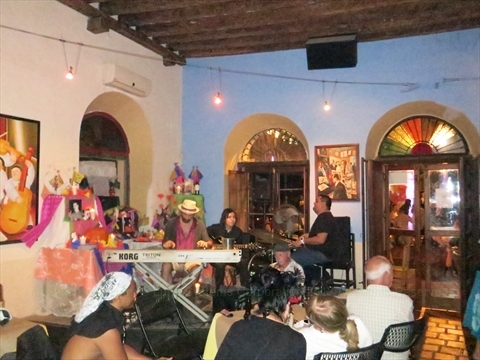 On weekends, there is live music at the Olas Altas location. 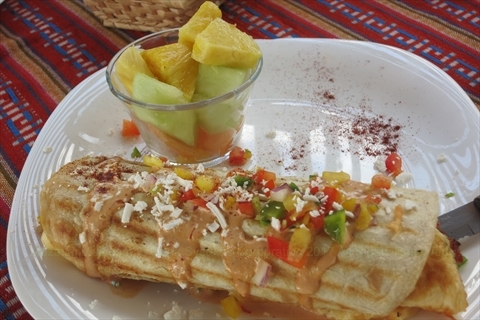 We have eaten at the Sabalo Country and Olas Altas locations and the food is excellent. 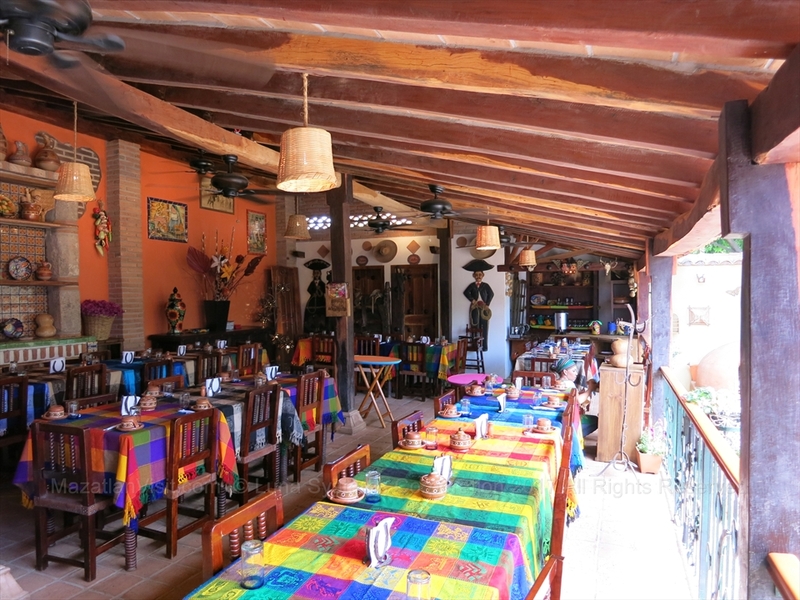 This is one of the beautiful restaurants in Mazatlán. 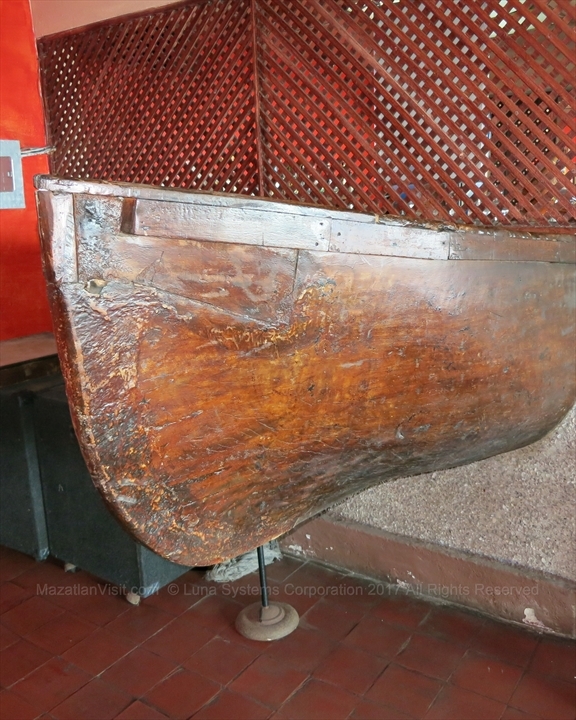 It is located inside the courtyard of a very old house in the old town of Mazatlán. There are vines and old trees growing. The bar is very long and spectacular. The food is very upscale and very good. We have eaten at the Presidio a number of times and the food and service are excellent! 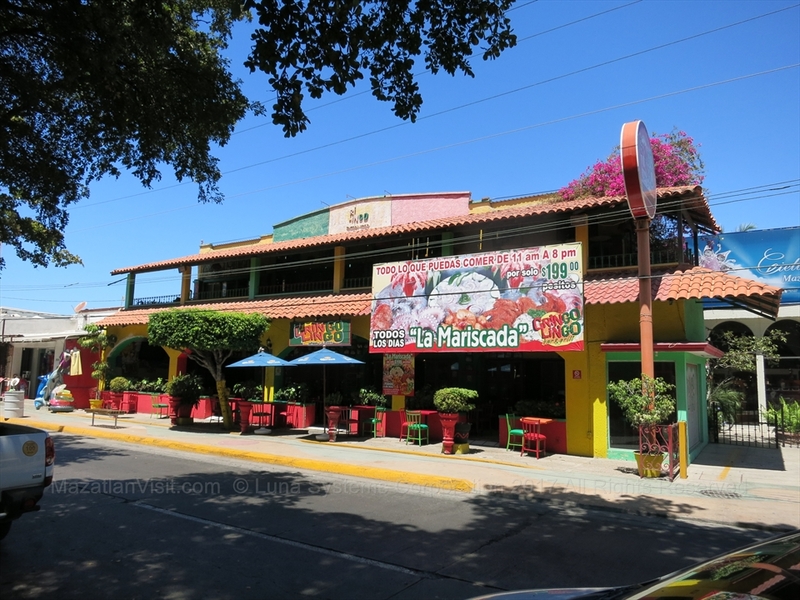 Ernie Tomatoes was a popular restaurant in the 1990s in Mazatlán. It was originally located in the Golden Zone, then moved north to Sabalo Country. It closed in the mid 2010s. It was fun like Señor Frogs restaurant and had a giant tomato hat that you could wear! 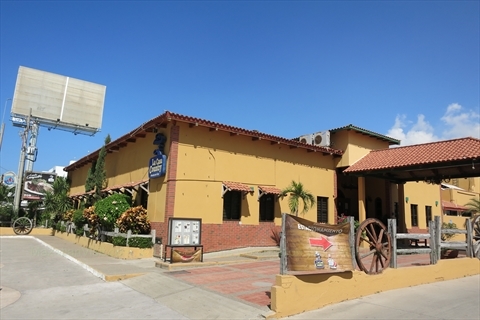 Fat Fish is a primarily BBQ Ribs restaurant in Sabalo Country area of Mazatlán. 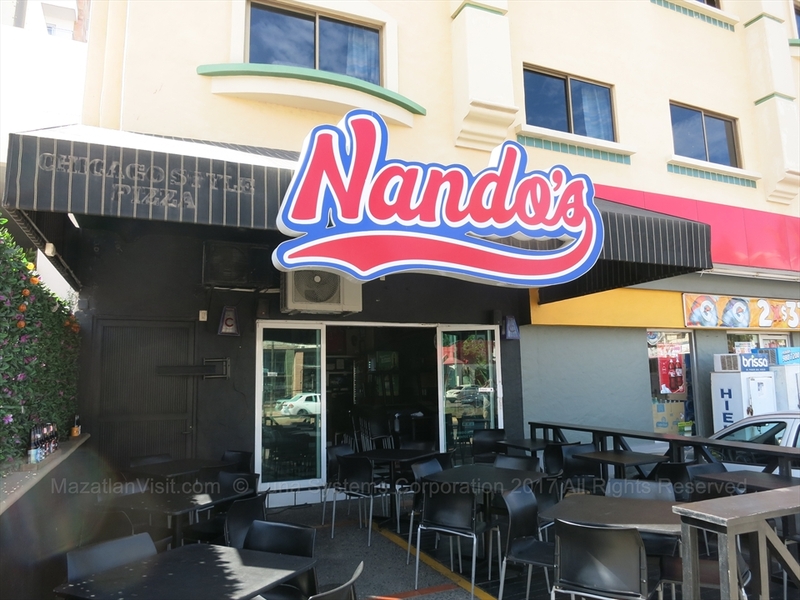 Although the name implies it is a seafood restaurant, and it does have seafood, it is primarily known for its BBQ Ribs. 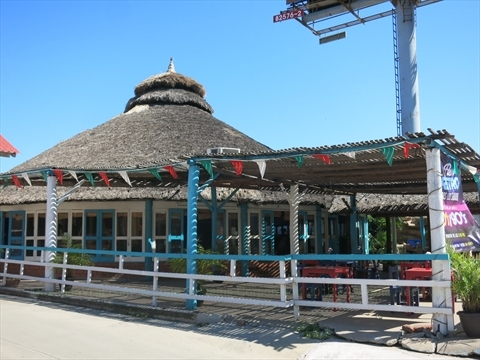 La Fiera is a fancy restaurant located in the Sabalo Country area. We haven't eaten at La Fiera yet, but have heard that the food is fantastic! F.I.S.H (Fresh International Seafood House) is obviously a seafood restaurant. It is located in the Golden Zone in the spot where Mr. A's restaurant used to be. It is high quality seafood at a mid-range price. In late 2017, everyone was raving about it's clam chowder being so good! It has both an air-conditioned and outside section. We have eaten here a number of times and the food is excellent! On Friday and Saturday nights, they have a large band that plays Mexican pop songs. 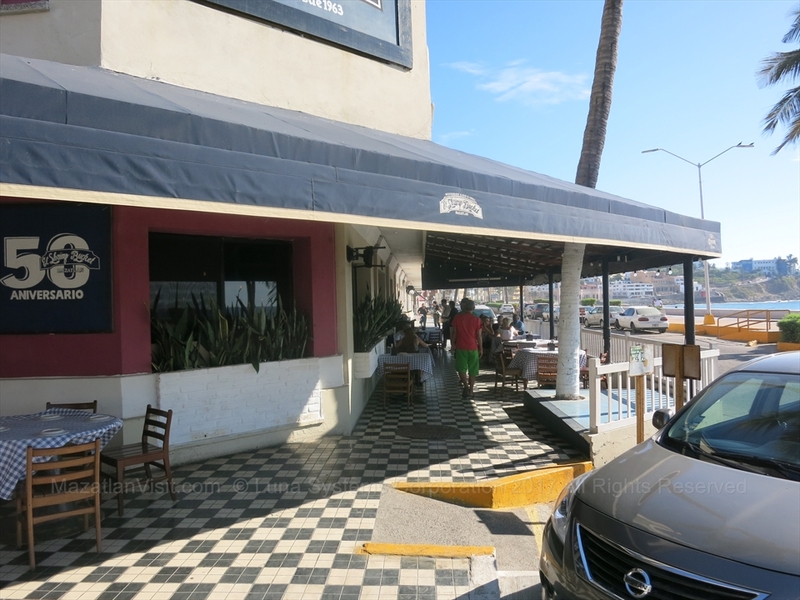 The restaurant patio usually fills up with a younger Mexican crowd which makes it feel more like an outside bar than a restaurant. Friend's Diner is new as of 2017 and is Canadian-owned. It is located in the heart of the Golden Zone. This is definitely a "gringo" restaurant. You will get big portions for a medium-price. It is open for breakfast, lunch, and dinner. The restaurant has entertainment such as live music and karaoke a few nights a week during the high season. They also have a few TVs on which they will show NFL, CFL, and NHL games, although the TVs aren't great. The owner of this restaurant used to own the Saloon. Friends Diner offers free phone calls to the US and Canada for customers. Friends Diner will be serving Canadian Thanksgiving dinner in 2018 for those Canucks who need their turkey! 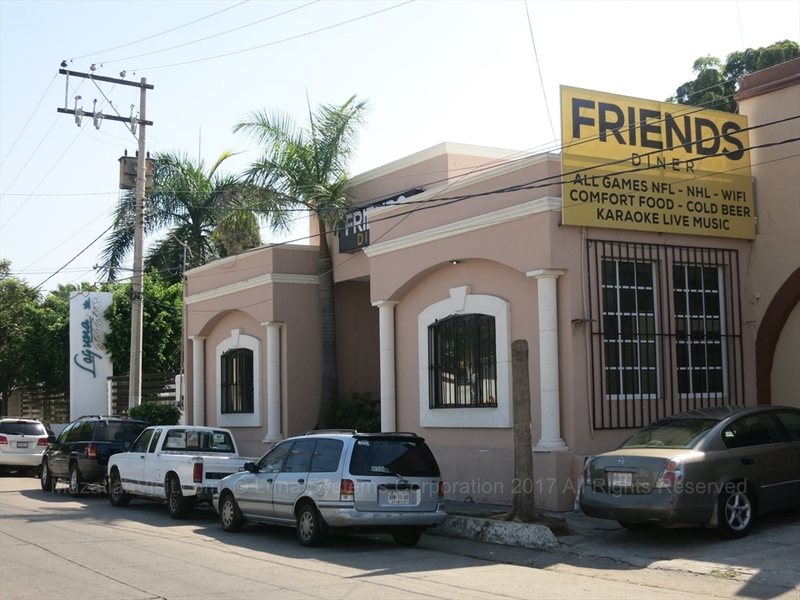 Friends Diner closes during the summer and usually reopens in October each year. The Golden Star Restaurant and Sports Bar is a small restaurant right in the middle of the Golden Zone. It caters to a more Mexican national crowd, but gringos are welcome. They have a few screens showing sports. They like to show the big boxing matches. 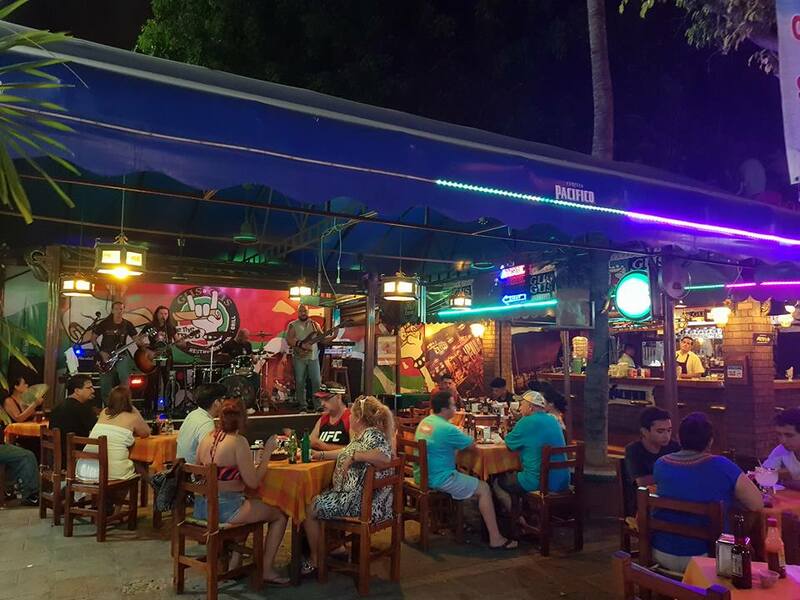 They will regularly have banda bands perform on weekend nights. 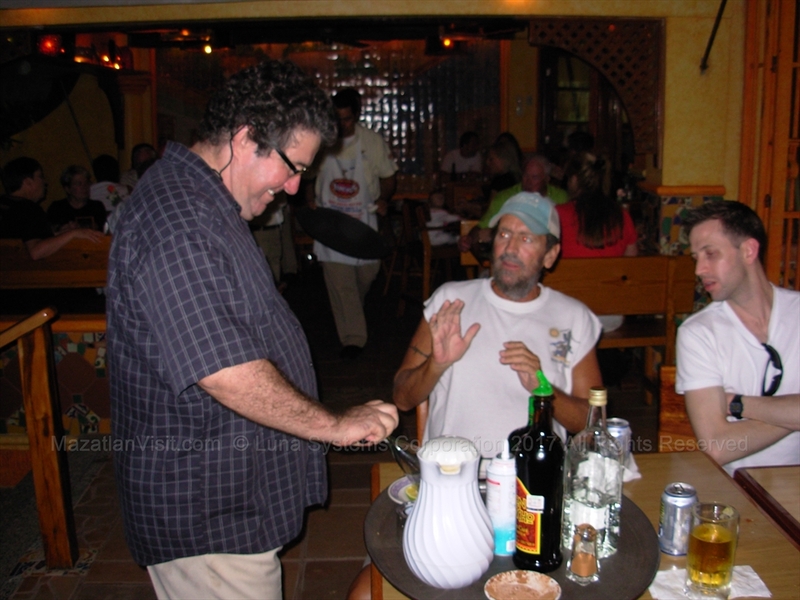 Gringo Lingo has been in the Golden Zone for many years. 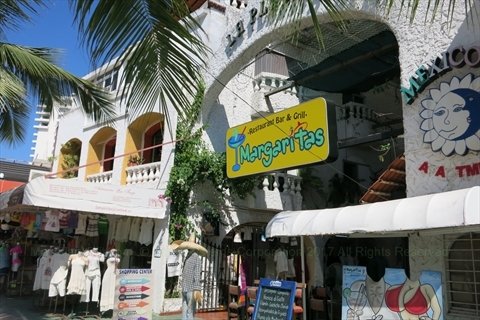 It used to be more of a Senor Frogs type tourist restaurant with waiters that performed a dance every night. Now, it is less busy and just more of a normal restaurant. The food and service are reasonably good. During the hot summer months they put in windows and air-condition the inside part. This is a restaurant/bar that has both an indoor air-conditioned section and an outdoor section. Some nights they have live music in the outside section. 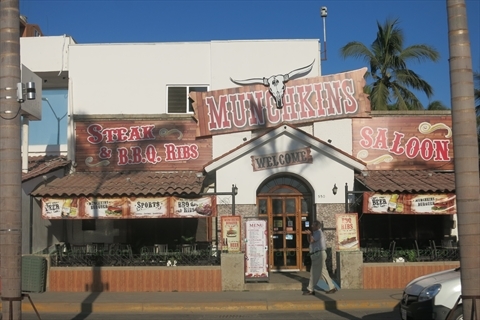 Address: : De Las Garzas 13, Las Gaviotas, Mazatlán, Sinaloa, Mexico, 82110, Phone: ? 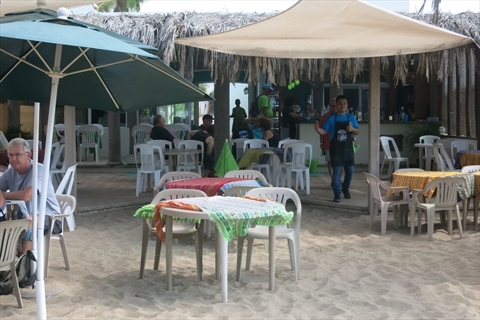 Joe's Oyster Bar is a beach bar in the Ramada Resort Mazatlán. They have really stepped up their game with respect to food. We especially love the shrimp basket! Food is served during the afternoon up to 6pm? It is a great place to grab a cold beer, some good food, and some good music! 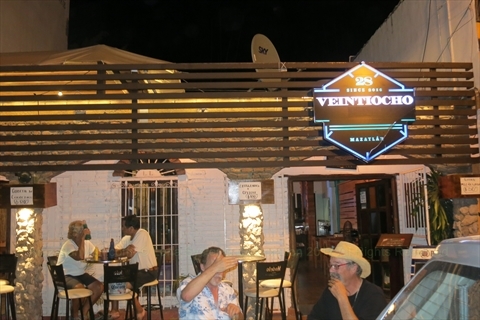 Address: : Playa Gaviotas 100, Las Gaviotas, Mazatlán, Sinaloa, Mexico, 82110, Phone: ? 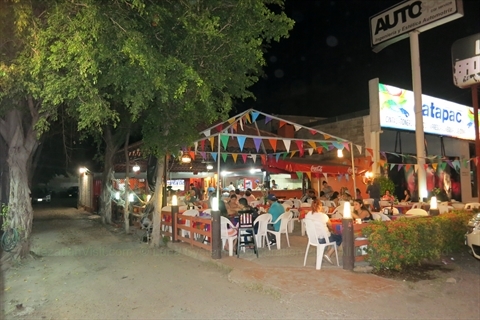 La Catrina is a restaurant/bar located in the Sabalo Country area of Mazatlán. It is an open-air restaurant that has a large bar. It primarily caters to foreign tourists, but has a large local clientele as well. It has TVs that show sports such as NFL Games. 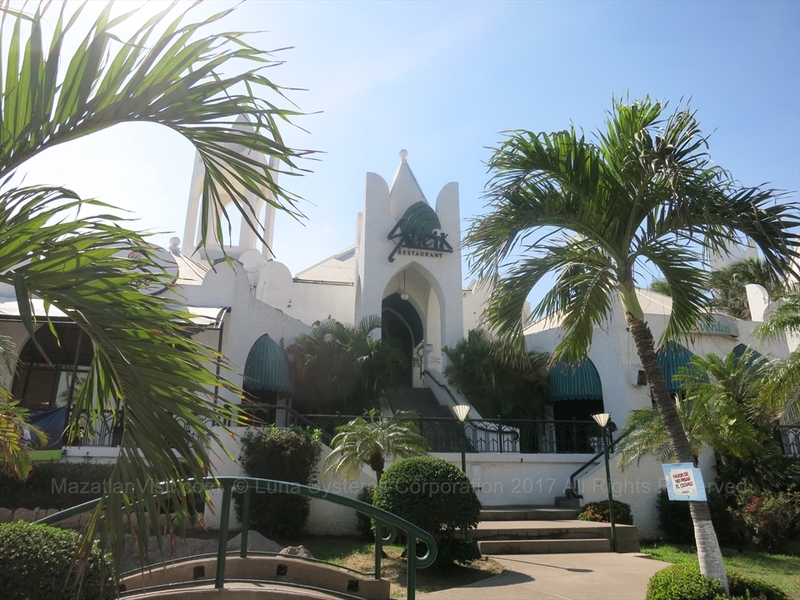 It also has weekly entertainment such as karaoke, singers, and bands. The prior incarnations of this restaurant were called the Purple Onion and Tres Amigos. 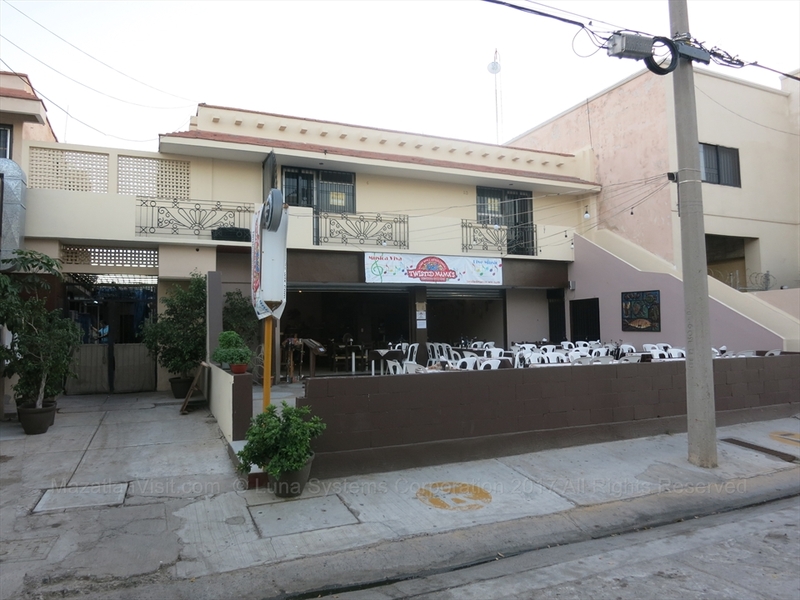 Las Brochetas is one of the gems of a restaurant in Mazatlán. It is located just on the outskirts of the Golden Zone. 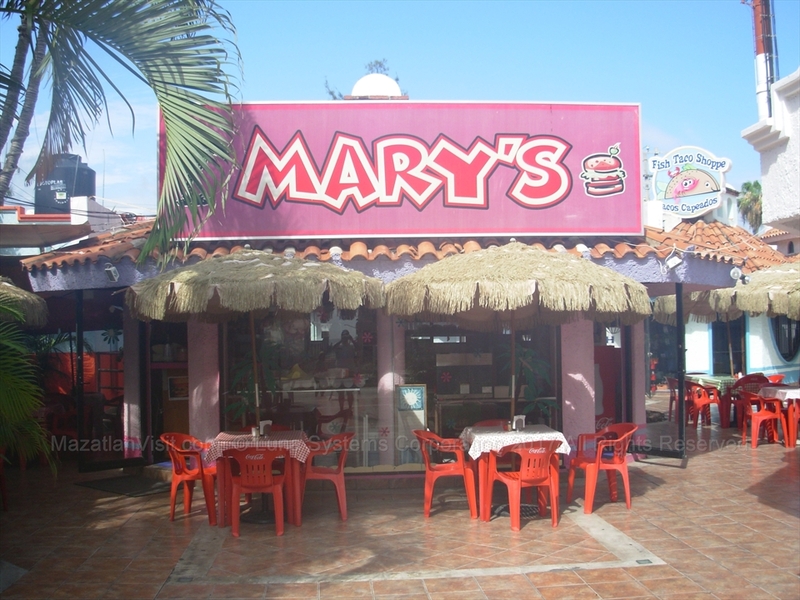 It is an open-air restaurant with plastic furniture on a busy street, but with the best beef in Mazatlán! They don't have a liquor license so you can bring your own wine or beer. The meat is fabulous! We have eaten here many times. Our favorites are the mocajete (Meat soup in stone bowl) and the meat brochetas! 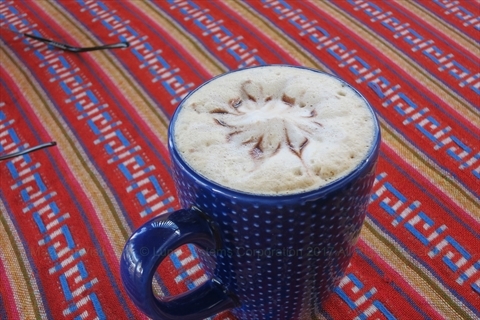 We think that they have the best mocajetes in all of Mazatlán! This is the place that you will see people all dressed up, bringing their own wine, sitting in plastic chairs on a busy street and totally enjoying the food! 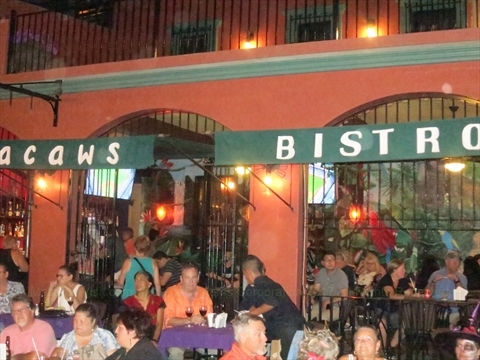 We highly recommend Las Brochetas for the "atmosphere" and for the best meat! La Casa Country is a long-time restaurant in Mazatlán. It is located in the Sabalo Country area of Mazatlán. It is a large indoor restaurant with parking. We have not eaten here so we cannot comment on the food or service. Life En Español is a restaurant in the Historic Old Town area of Mazatlán. 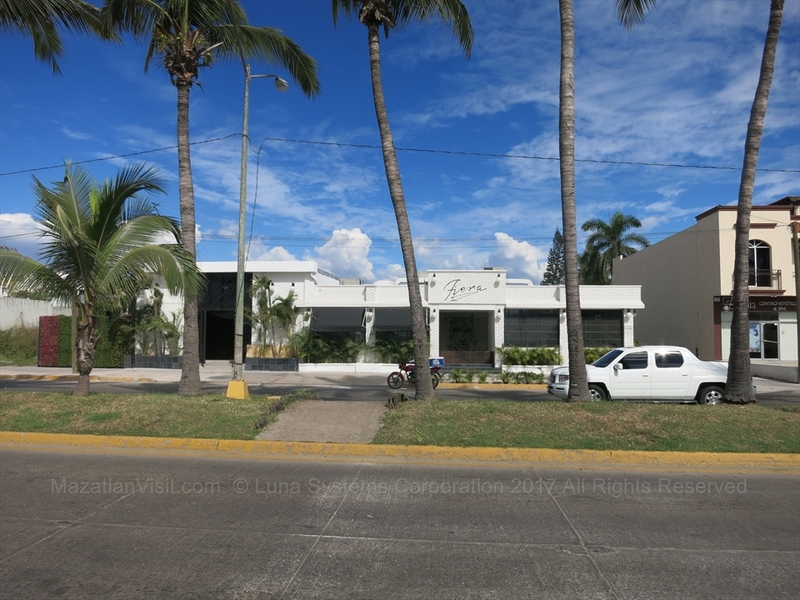 Life En Español is a large restaurant/nightclub in the Golden Zone area of Mazatlán. It is part of the large El Cid Megaresort! 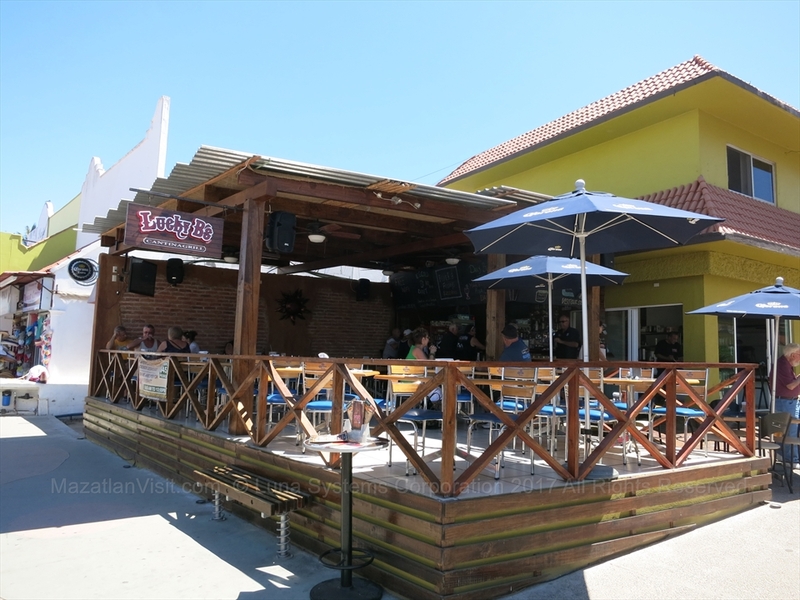 It was formerly the last location of Senor Frogs and originally El Caracol, the El Cid's night club. 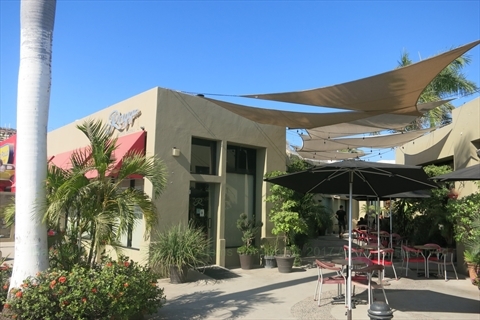 This is a restaurant located at Cerritos that is open-air. They have karaoke(Mondays, Saturdays) and bingo (Thurdays) weekly. They also have a free pool table. The owner has his own brand of tequila that you can try out. We did and it is fabulous...if we can remember clearly! 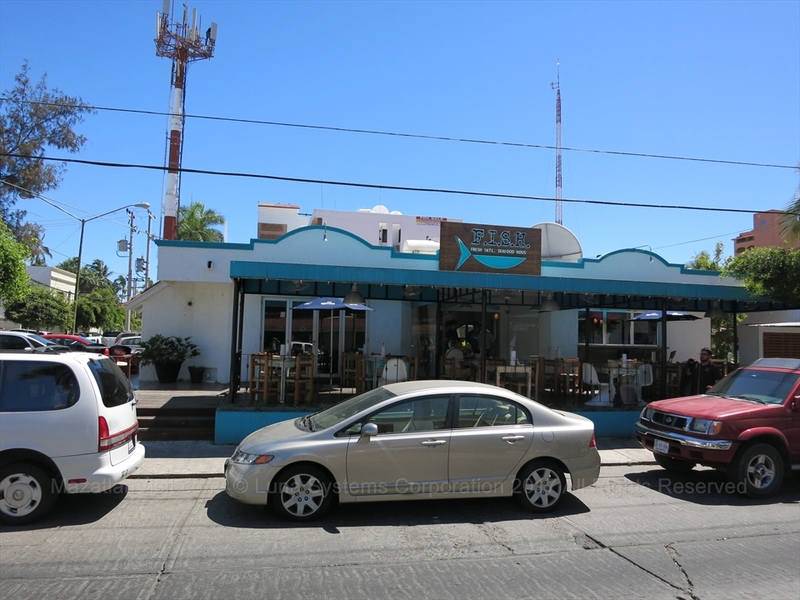 This is a small restaurant located one block in from the beach at Olas Altas. They call themselves the 'Cheers of El Centro'. 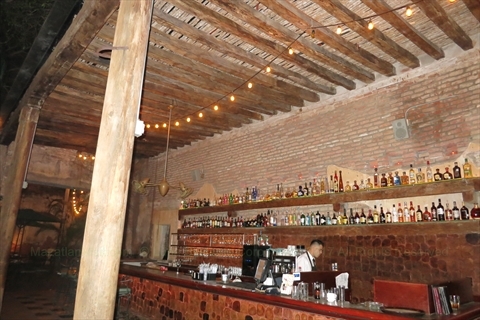 It is an American-owned restaurant/bar that has a small boutique hotel attached to it. They serve comfort food and Thanksgiving and Christmas Dinners. Some nights they have live music and have TVs for sports and is popular for Monday Night NFL Football games! Note that there have been other restaurants with the name Puerto Azul. This is the one directly across from the Hotel Plaza Amigo (big green hotel) on the Malecon! Mr A's was a long-time fancy restaurant in the Golden Zone. It closed in the mid-2010s. The location is now home to F.I.S.H. Restaurant. 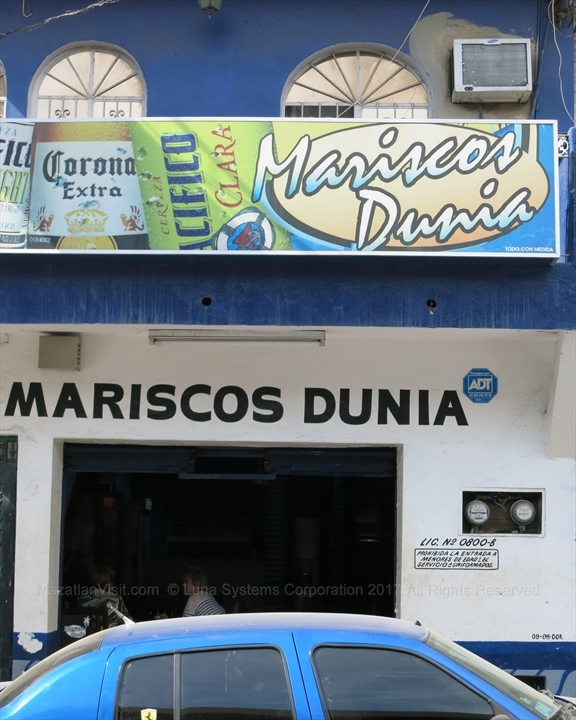 This is a longtime beachfront restaurant in the Cerritos area of Mazatlán. It has a full menu. The food is excellent. They have live relaxing music most evenings. This is a place that has food trucks, a golf driving range, and batting cages. 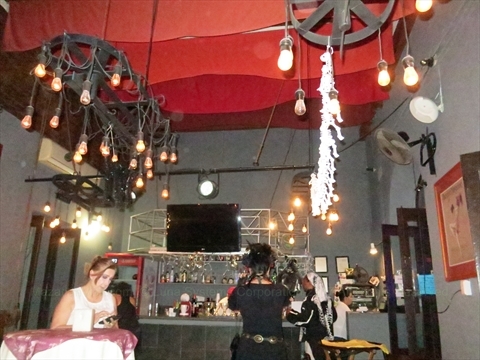 Pinups is a new restaurant in the Golden Zone that opened in late 2018. It shares a plaza (and bands) with Lucky B's. The food is high quality. They have some TVs where they show the big UFC, Boxing, and Mexican Soccer games. Por Que No was a Sports Bar in the Golden Zone. 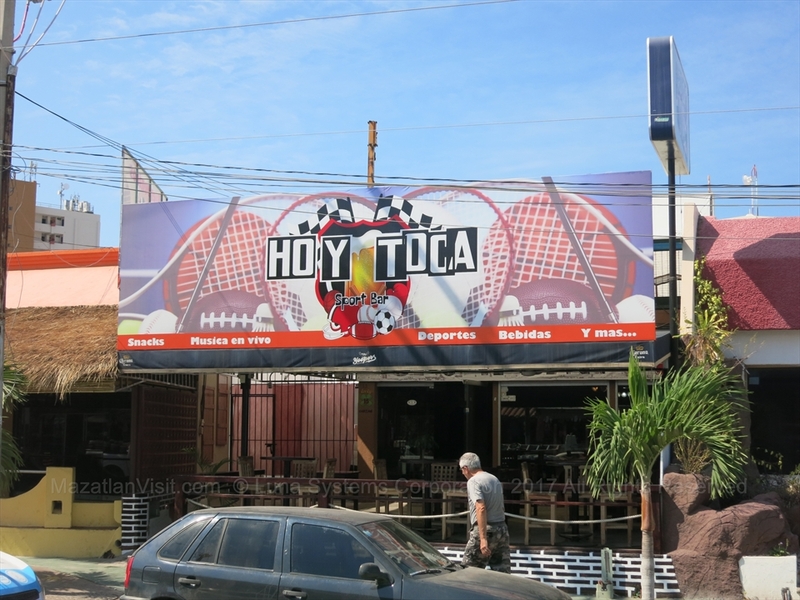 This location has re-opened as Hoy Toca, and in late 2018 became Simba. healthy food restaurant, smoothies, wraps, etc., high quality food. 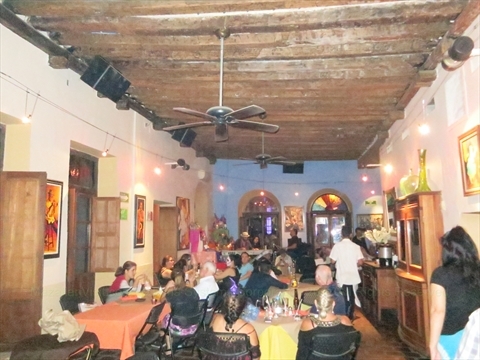 This is an upscale Italian restaurant located in the Golden Zone and in the Old Town of Mazatlán. Our review: We have eaten here and the food and service were fantastic! We highly recommend it. 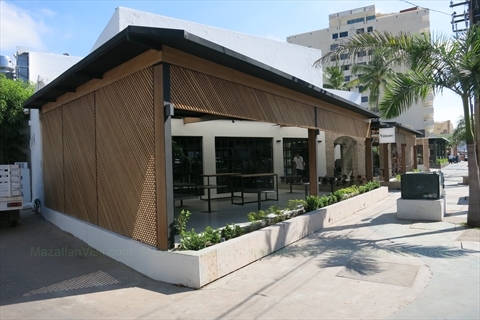 The Roadhouse Restaurant and Sports Bar is a brand new, as of January 2019, restaurant in the Cerritos beach area of Mazatlan. It is located across from the Mayan Palace. It serves breakfast, lunch, and dinner. 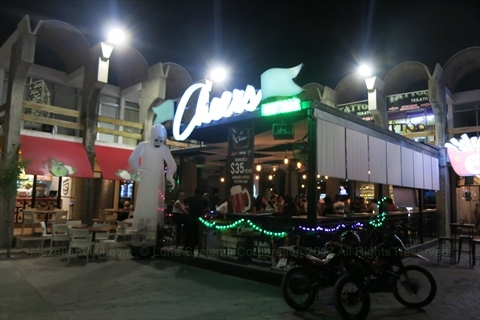 It is has weekly entertainment such as karaoke and live music as well as Mexican, Canadian, and American sports. The Saloon was a nice little Canadian run Sports Bar in the Golden Zone that served comfort food and allowed you to catch most of the Canadian and US sports. The owner closed it down and now runs Friend's Diner a few blocks away. 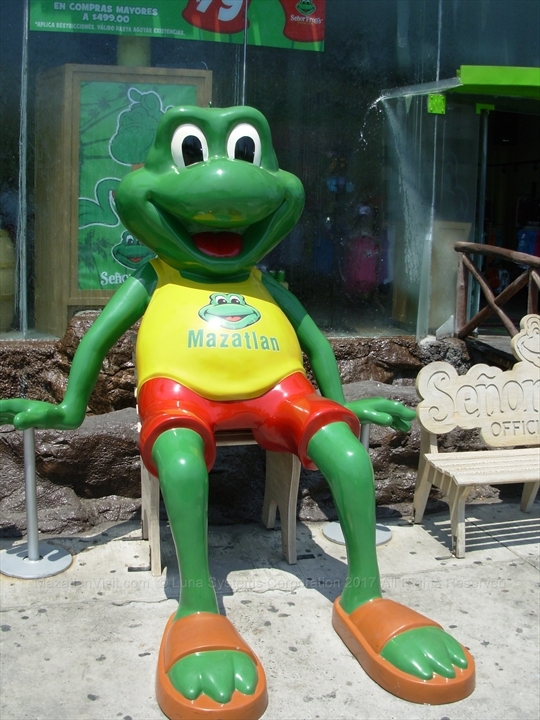 Señor Frogs, the famous restaurant chain, was started in Mazatlán. It was the restaurant that put Mazatlán on the map as a party town allowing patrons to get drunk and dance on the chairs and tables! 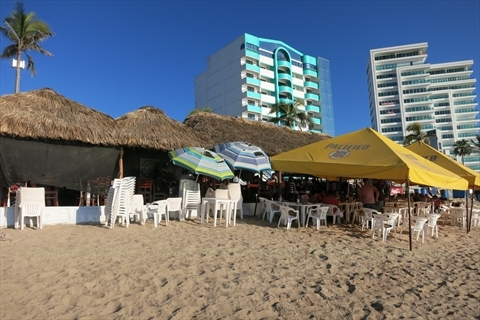 There was always a Señor Frogs restaurant in Mazatlán up until 2017 when the last location closed. There are still many Señor Frogs stores selling the merchandise, but unfortunately you will have to go to other cities to eat at a Señor Frogs now! The Sheik was a fancy restaurant located in the Fiestaland (Valentino's) castle complex. It closed in 2016. 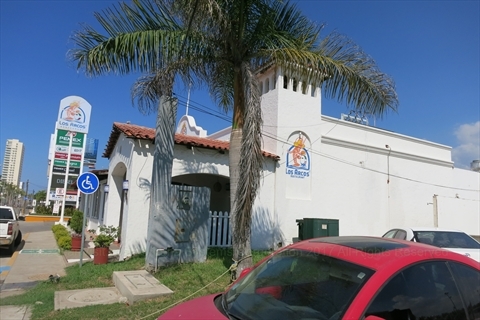 The El Shrimp Bucket restaurant is a long-time restaurant on the main street in Olas Altas. As the name suggests, it is primarily a shrimp and seafood restaurant. It has both indoor and outdoor seating. 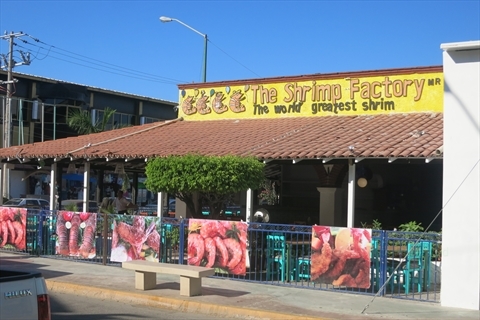 This is a shrimp and seafood restaurant in the heart of the Golden Zone in Mazatlán. You can buy shrimp here by the kilo! This restaurant is new in the summer of 2018. It replaces Hoy Toca. This is a restaurant/bar that has both an indoor air-conditioned section and an outdoor section. Some nights they have live music in the outside section. They have a pool table inside. 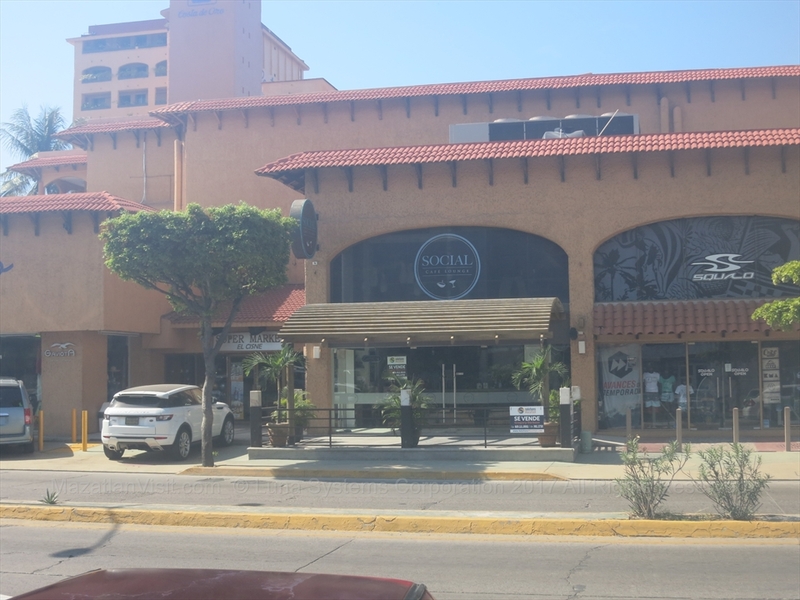 The Social was a small coffee shop restaurant located in front of the Hotel Costa De Oro. It closed in 2016. 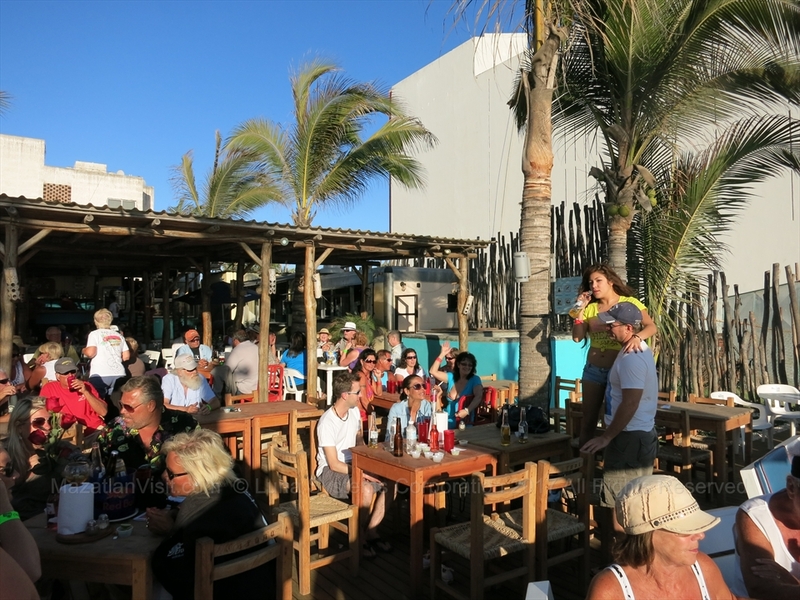 Surf's Up Beach Cafe is a laid-back style cafe located in the Emerald Bay area of Mazatlán. It is located right on the beach. It serves fancy coffees, breakfasts(until noon), and sandwiches. They also have regular live music during high season. Surf's Up sells Mazatlán Venados Baseball seasons tickets with a portion of the proceeds going to charity. There is more information about this promotion on their 'Events' page on their website. Surf's Up also has a booth on the food concourse at the Teodoro Mariscal Stadium. They even sell various types of poutine, the Canadian food! This is funky restaurant that has a triangle shape at the edge of the golden zone. 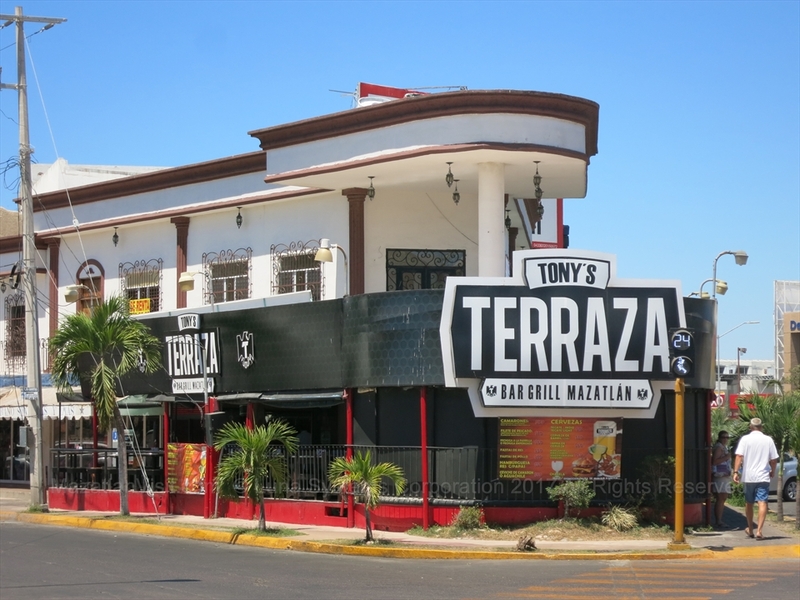 &nbps;It was a long-standing restaurant then closed for a while and re-opened as Tony's Terraza. They offer food, but it is more of a bar with live music most nights. The music is loud here and it is more of a mexican crowd, but gringos are welcome. We usually go here for a drink in between other bars. 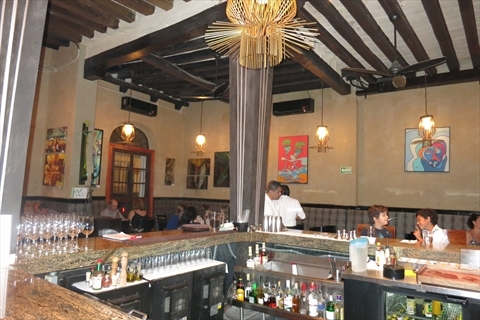 This is an upscale restaurant in an old building in the downtown/old town area of Mazatlán. We have eaten here and the food is fantastic! It also has a really cool bar in a separate room. Some nights there is one person live mellow music. Topolo is re-opening on October 4, 2018 for the 2018-2019 season. 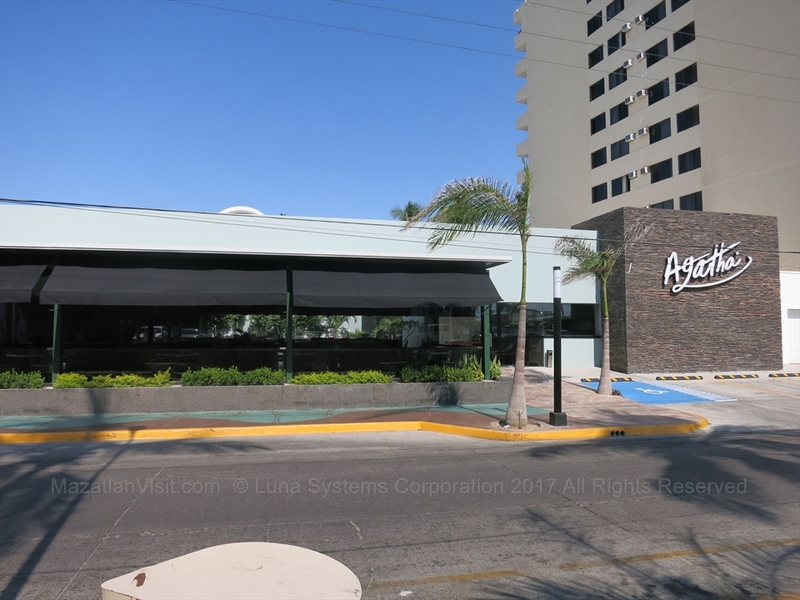 Newly opened in December 2017, La Tostaderia Del Mar is located right on the island inside the marina in Mazatlán. This restaurant has great views of the marina! As this restaurant has just opened up, we have not eaten here yet so cannot give a personal review. Note: Twisted Mamas usually closes for the summer and reopens in early October each year. 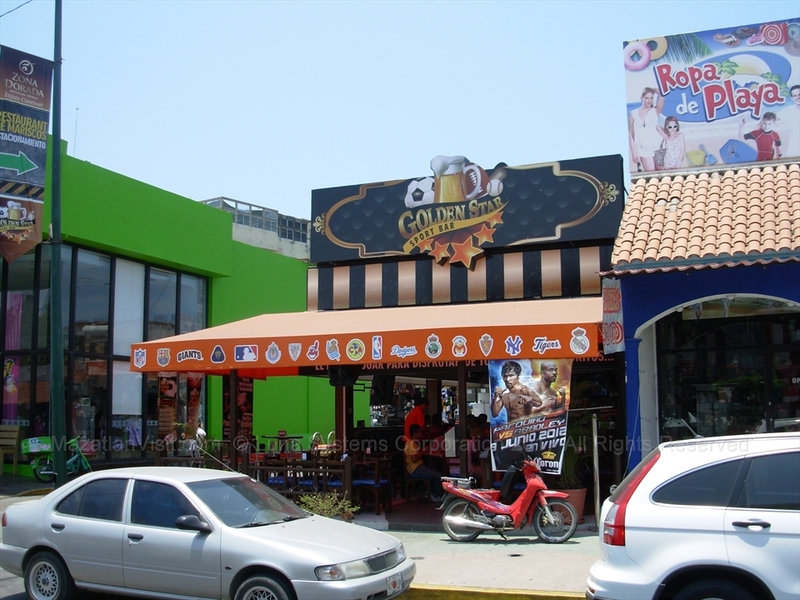 Twisted Mamas is a restaurant/bar located right in the middle of the Golden Zone in Mazatlán. It has both indoor and outdoor sections. It is open seasonally for the fall-winter tourist season. It is Canadian-owned and operated by Cindy Bieber. It offers a full menu and there are bands on many nights. It also brings in tribute artists to perform monthly. Twisted Mamas is one of the few places in Mazatlán where you can get turkey dinner on Thanksgiving Day (both for Canada in October and USA in November) and Christmas dinner. Normally, these dinners sell out so you need to reserve as soon as possible. Twisted Mamas is located 1 block in and a few doors in to the right from the Panama restaurant on the main street (Ave Camaron Sabalo) in the Golden Zone or if you are coming the other way 1 block in from the Shrimp Factory and a few doors in on the left. This is almost across the street from where the now closed Jungle Juice bar is. This is a new restaurant for fall 2017. Juan, who used to be a server at the Saloon, runs this restaurant. It is on a quiet side street a block in from the new Holiday Inn Resort Hotel. It has funky decor and has just undergone a remodel in the summer of 2018. It has an inside and an outside section. Also, there is live music 7pm-10pm Wed to Saturday. Our review: We haven't eaten here yet, so we can't comment on the food, but the place looks cool and would be willing to give it a try! Vittore is an upscale Italian restaurant that is part of the Ramada Mazatlán Hotel. It has been open since 1997. In fall of 2017 they have made some renovations to the front of the restaurant. It has an inside and an outside section. Our review: The food and service are good at Vittore. If you are looking for some good Italian food we would recommend this restaurant. It is also a good place for a quiet romantic date! Yoopers was a gringo sports bar in the Golden Zone. There have been a number of restaurants in this location since Yoopers. 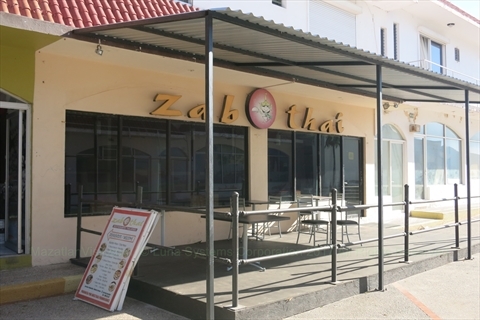 Zab Thai serves more traditional asian dishes. It has been around for many years in the Golden Zone. The current location, in the back of Lucky B's, is small and not very fancy. They do deliver. Our review: We have eaten here a number of times. It is probably the best asian food that you can get in Mazatlán, but would only be average in a city such as Vancouver. The place is not fancy and they don't always have everything on the menu available. 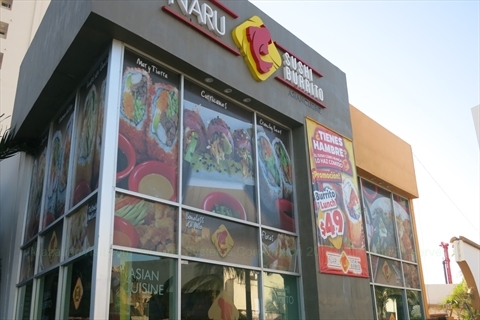 So, if you are in Mazatlán and are craving some asian food, this would be the place to go to. 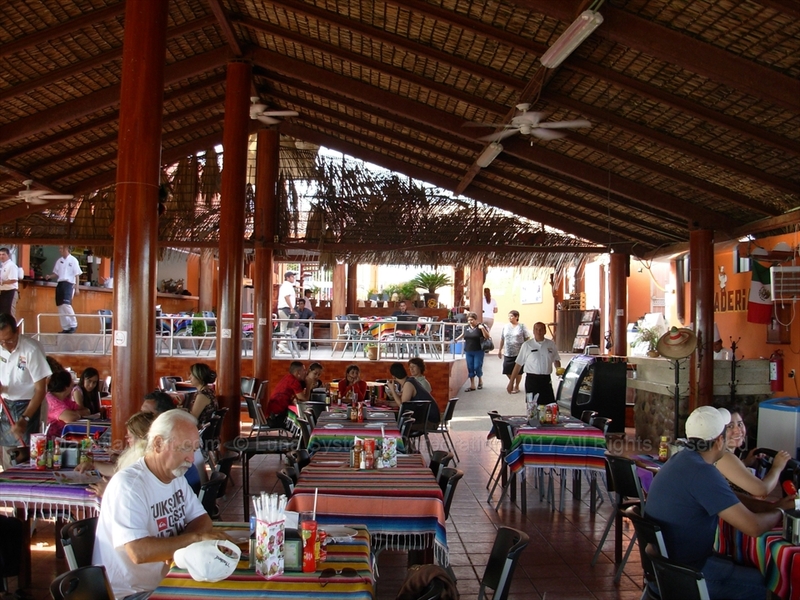 Throughout Mazatlán you will see food stands. Normally, these are on corners. In the Golden Zone, there are many hot dog stands. There are larger stands which sell other foods such as tacos and seafood. Our rule for eating street food is that the place must be busy with people! This means that the food turns over and thus should be fresher! 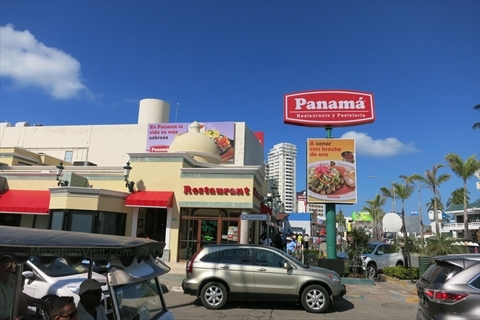 There are many fast food restaurants throughout Mazatlán. McDonalds was probably the first of the foreign fast food restaurants. There are large McDonalds, Burger King, and Carl's Jr restaurants in the Golden Zone. 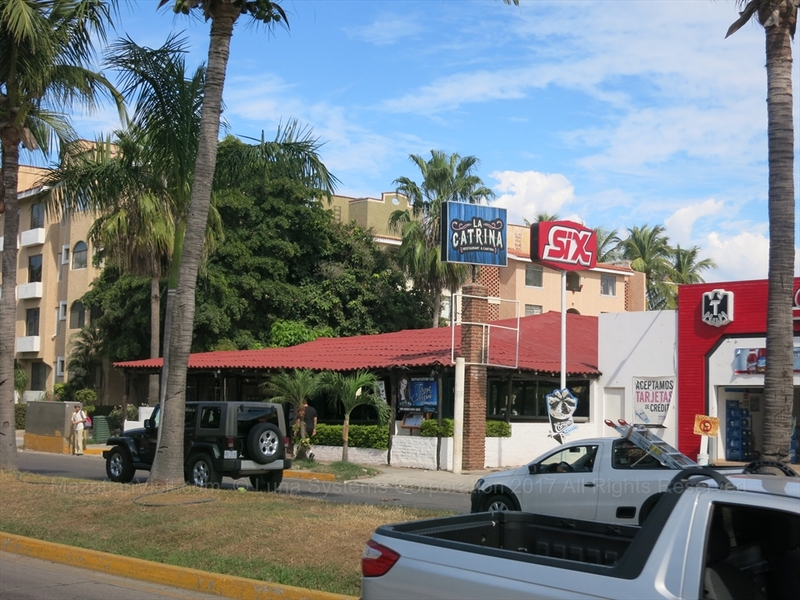 There is also a Burger King in downtown Mazatlán. The Dominos in the Golden Zone closed in 2018 and is now called Brothers Pizza. It is operated by the same guys that ran the Dominos.